Since last week’s post on XKCD fairy tales was so popular and many of my favorite webcomics have referenced fairy tales in the past, I decided to start a new recurring feature called Once Upon a Webcomic. My second webcomic post centers around another of my favorites: “Dinosaur Comics” or “Qwantz” by Ryan North. Although Dinosaur Comics has referenced fairy tales on a number of hilarious occasions, the following comic is my favorite example of this. 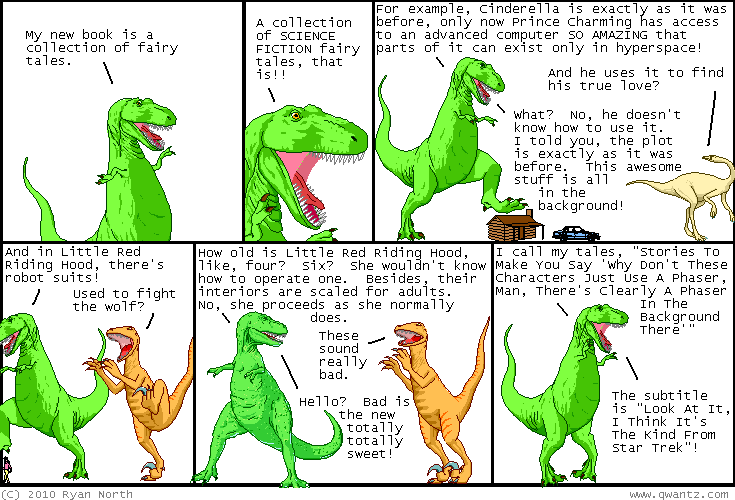 As you can see, this comic takes a humorous poke at fairy tale retellings. While many of them are interesting and inventive, some do seem a little silly. For instance, take a look at the plot of Disney’s upcoming film, “Snow White and the Seven“; if Snow White is a British woman in China in the 1800s and the dwarves are actually not dwarves but international warriors teaching her how to fight, is it really even the same story? Sure, the concept sounds pretty cool, but at what point does it begin to distract from the actual story and become a little pointless? I can’t help but feel the same about Maureen McGowan’s new books “Sleeping Beauty: Vampire Slayer” and “Cinderella: Ninja Warrior.” I’ll give them the benefit of the doubt and read them on the off chance that they may actually be cool and funny mash-ups, but frankly they sound a little ridiculous. Hopefully, that’s intentional. To see some other fairy tale references in Dinosaur Comics, check out the comics from November 20, 2003 and May 31, 2006.